Icy-cold soda may be a refreshing treat under the scorching sun, but could be a major health risk in disguise! Loaded with tons of sugar and devoid of any nutritional content, soda continues to be one of the most popular beverages across the world. Sugar-packed fizzy drinks are all the rage! But then, excess of anything is bad! And if it is sugar that is being talked about, the results are bound to be worsened. Too much consumption of soft drinks can potentially knock you down! Soda or liquid sugar is something that is known to have extremely disastrous effects on the health of individuals. Such is the impact that a study in 2009 published in the journal ‘Circulation’ claimed that, high intake of dietary sugars in the setting of a worldwide pandemic of obesity and cardiovascular disease heightened concerns about the adverse effects of excessive consumption of sugars. Besides, regular consumption of soda imposes numerous other issues on your health. One of the primary causes of obesity is the increased consumption of soda (sugar-sweetened drinks). Soda contains excessive amounts of liquid sugar such as high-fructose corn syrup, which does not satisfy the hunger hormone ghrelin. So you feel the hunger as before and end up eating the same amount of food but with hundreds of extra sugar calories on the side. Regular consumption of sugar makes your body prone to storing more fat. And fructose, specifically causes accumulation of dangerous belly fat (visceral fat) that leads to various metabolic diseases. According to a 2001 study published in The Lancet, sugar-sweetened drink consumption led to an increase in both BMI (body mass index) and frequency of obesity in children, thus leading to childhood obesity. One major adverse effect of higher soda consumption is the increased risk of diabetes (Type-2 specifically). Excess consumption of soda (liquid soda) makes the cells in the body resistant to the effects of insulin. Further, liquid sugar gets absorbed in the body in no time leading to a sudden rise in blood sugar levels. This elevation triggers an insulin reaction and the liver transforms the liquid sugar into fat leading to raised cholesterol and elevated glucose levels. This condition ultimately is the cause behind diabetes. 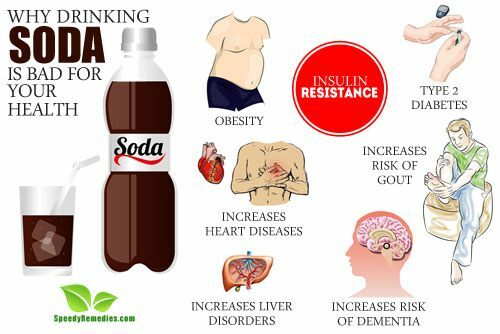 In fact, according to a 2009 study by the American Diabetes Association, daily consumption of soda increased the risk of incident type 2 diabetes by relatively 67% compared with non-consumption. High consumption of sugar-sweetened drinks is directly proportional to weight gain, which ultimately is the reason behind most cardiovascular ailments. According to a 2007 study, published in Circulation, consumption of more than one drink per day is linked to increased incidences of multiple cardiometabolic risks. Daily consumption of soda witnesses increased amount of fructose in the body posing greater risks on cholesterol fractions, blood glucose, blood triglycerides and inflammatory factors. This further leads to an increased risk of strokes, heart failures and other cardiovascular diseases. Another 2012 study published in the Circulation stated that consumption of sugar-sweetened beverages increased the risk of coronary heart diseases and brought about some adverse changes in lipids, leptin and other inflammatory factors. All the sweetness in soda comes from fructose, fructose raises uric acid, and increased uric acid levels cause inflammation and pain in the toe, ultimately leading to increased risk of gout. Gout occurs due to crystallization of uric acid in the blood that causes intense pain and swelling. And heavy consumption of fructose is one major cause behind this increased risk. Increased consumption of soda poses greater risks of strokes which is the foundation of dementia (neurodegenerative conditions) on the human body. Higher levels of sugar in the drink lead to increased insulin and blood glucose levels that further leads to insulin resistance, glucose intolerance and inflammation. These physiologic changes encourage thrombosis, atherosclerosis and plaque stability, all of which are risk factors of dementia. Large doses of soda lead to impairment of memory causing Alzheimer’s disease and other mental health problems. One of the most devastating adverse effects of drinking soda is the increased risk of cancer. According to study published in Cancer Epidemiology, Biomarkers & Prevention, a journal of the American Association for Cancer Research, people who consumed two or more soft drinks a week had an 87 percent increased risk of pancreatic cancer. The process of artificial caramel coloring, which is, used in soda to impart it its brownish hue leads to production of a carcinogen called 4-methylimidazole (4-MEI). This carcinogen makes the drink even more harmful, posing greater risks of cancer in the body. According to a 2010 study, published in the Natural Medicine Journal, consumption of two or more soda drinks a week almost doubled an individual’s risk of developing pancreatic cancer. Additionally, postmenopausal women who are into regular consumption of soda are at higher risks of developing cancer in the uterus lining, which is known as endometrial cancer. Higher consumption of soda leads to higher accumulation of fructose in the body, thus leading to higher risk of inflammation and swelling. This increased inflammation ultimately leads to increased pain in bones and joints, thus deteriorating the bone health. Soda poses a unique challenge for healthy bones. The high amounts of phosphoric acid contained in the drink causes an adverse effect on human health. It causes cavities, bone softening and osteoporosis by hampering with the body’s ability to absorb calcium. Higher consumption of soda displaces the body’s capacity to absorb more nutrients thus lowering bone density and posing higher risk of fractures. Soda contains sugar that is composed of glucose and fructose. Soda contains excessive amounts of fructose that accumulates in the liver and converts into fat. Only a portion of this gets eliminated as blood triglycerides while the major part remains in the liver causing non-alcoholic fatty liver diseases. The heavy amounts of fructose in sugary drinks and soda is enough to feed the bacteria in mouth, ultimately causing tooth decay. Soda also wears down tooth enamel, thus making teeth more prone to cavities. Therefore, regular consumption of soda proves extremely harmful for the dental health. It contains carbonic acid and phosphoric acid, which cause erosion and further decay of teeth.